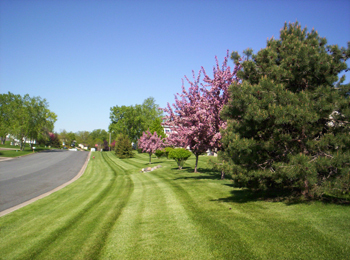 Spring is one of the most important seasons for your landscape. Winter clean up tasks and preparations projects need to be accomplished to ensure you have beautiful grounds for the summer season. We use only professional turf sweepers to lightly de-thatch all lawn areas and pick-up debris. Our spring regimen starts with a throughout clean up from the winter. 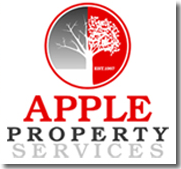 Broken tree branches, left over sand and salt, and general pick up will be completed by Apple Property Services as soon as weather and grounds conditions will permit. Minnesota winters can be taxing on landscapes. Our services include repairing landscape turf where winter burn has occurred. We also deliver mulch, rock, and soil to help renew landscapes. Annual beds add a great deal of color to grounds. Our professional crews are exceptional with renewing annual beds with a wide variety of annual plantings. As landscape professionals, we are well versed in the types of annuals and how they will grow in your sunny and shady conditions. Mowing operations will be performed on a specific day each week as weather permits. Mowing will be rescheduled due to rain if necessary. Occasionally, mowing of certain areas will be skipped due to minimal growth or drought conditions. A spring application of fertilization with pre-emergent also crabgrass control will be applied. Spring weather plays an important role in application timing. Spot applications of weed control will be made during the growing season as deemed necessary by APS and/or the customer.